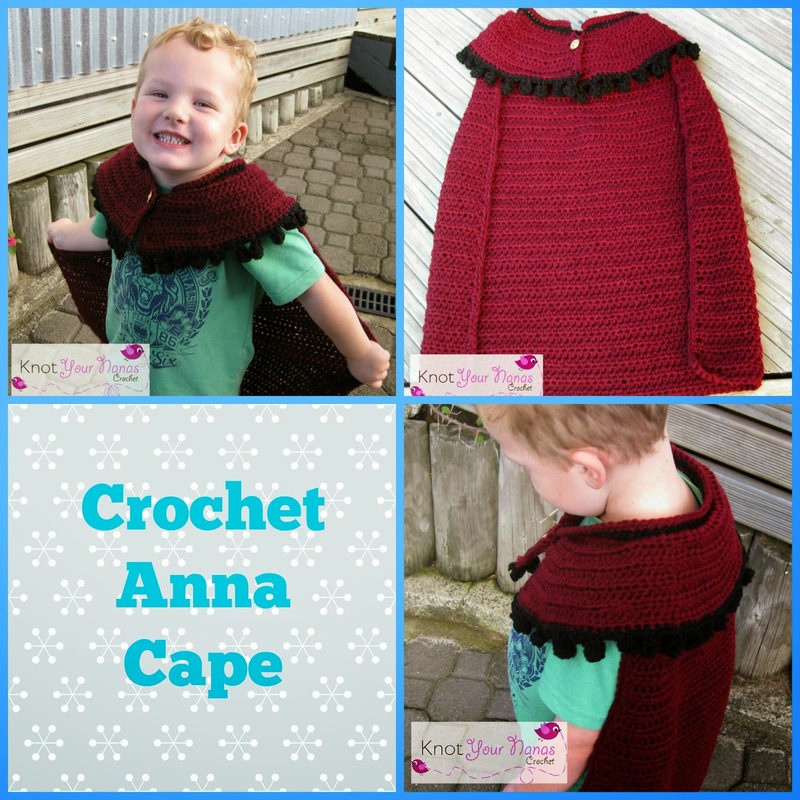 My kids love playing dress ups and this royal cape is great for that. It is pictured here on an average size 4 year old with room to spare so at a guess it should fit up to a 6 year old with just adjusting the length of the cape. It also fits okay on my 3 year old. If in doubt test the first row around the neck of the child you are making in for. This pattern has not been tested so if you find any mistakes or have trouble with anything please leave a comment below or email me at knotyournanascrochet@gmail.com so I can help and fix it for the next person. 8 ply/dk yarn (I find a light worsted weight/10 ply yarn can often be substituted provided you match gauge) I used a maroon yarn because it was the closest colour I could find in my small town but I think her coat is more a dark pink. I used about 230 grams of maroon and less than 50 of the black. 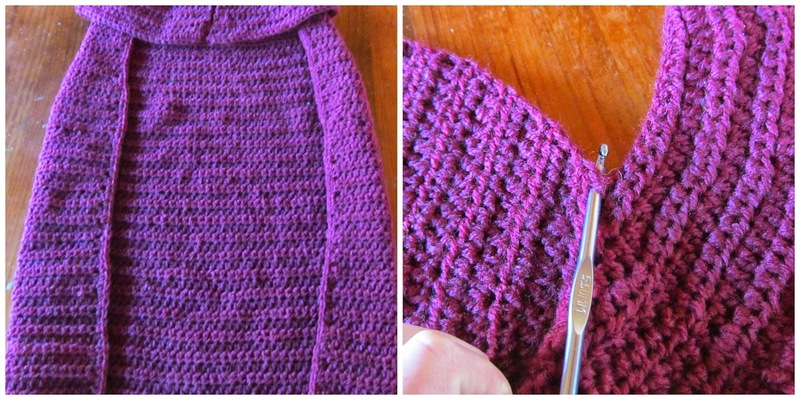 Gauge: 5 rows x 7 stitches in 2 inches done in hdc. Note: when working into the beginning ch only go through one loop. Some people go through two and this will make it harder to attach the cape part. Along the collar, count 16 stitches in from each end and mark with a stitch marker. With right side facing you, join yarn in back loop of the stitch marker on your right. The middle picture in collage above shows the loop you will be working into. Turn your work around so this loop is on the back and you will be working down into it. The last picture shows the first row of the cape complete with the front loop left unworked for the Upper Collar. Starting in stitch shown under collar, ch 1, sc evenly in each stitch around. Finish on other side underneath collar. Place 3 sc in each corner to make the turn. Now we want to join the maroon in the stitch shown in the left hand picture. Join black yarn in stitch shown. Ch 1, sc in same st as ch 1, sc in next st, *ch 6, 5 dc into 4th ch from the hook. Pull loop on your hook up, remove hook from loop and place in top of first dc from front to back. Grab the loop with your hook and pull through to tighten cluster and form a pom pom shape. Sc back down ch (2 ch), sc in next 3 stitches. * Repeat between * across ending with 2 sc. I attached button by just pushing through the stitches but another option would be to create a ch loop to hook around the button. I'm totally excited to make one of these. I'll need to figure out Elsa's, too, if I know my daughter! Thanks for sharing! Thank you so much for the pattern! I found it posted by Moogly and was so excited! I was just going to begin a Frozen Inspired search for crochet and/or sewing. I am making just about the whole cast for the gran'kids. Thanks again so very much! Just above the comments you should find a green button that says Print Friendly. Click on that and follow the instructions to print. I just saw Frozen for the first time two weeks ago; I loved it and I love this cape! What a neat pattern. Thank you very much! This is beautiful!!! I featured it in a round up at MNE Crafts!! I love this pattern. Do you mind if I sell items I make from this pattern in my etsy store? I would of course include a link back to here in the listing to give you credit for the pattern. Hey thanks :) Feel free to sell any item's made from my patterns. How much yarn is needed for the hats and the Elsa and Anna capes?